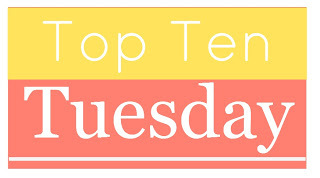 The Broke and the Bookish host Top Ten Tuesday every week. It's a meme where bloggers around the world make a list of their Top Ten Items related to a certain theme. This week the theme is "Top Ten Things that Instantly Make Me want to NOT read a Book"
I've never been much of a violence fan, so books involving zombies are very uninteresting to me. I neither enjoy horror books or movies, and find that the writing can be over-dramatized in these novels. Similar to zombies, I never had an interest for them. Not growing up, and certainly not now. I actually don't think I've ever read and enjoyed a book with pirates in them! I often put down books that compromise grammar for characterization. Sometimes it's alright, but when coupled with bad grammar in the narration, I just cannot deal with it! I've read way too many of these books. I find that while they are interesting during the reading period, you later realize that they are all very similar. I love beautiful covers, but book jackets are extremely hard to maintain and just get in the way of reading! I prefer books where the cover is printed on rather than printed on a jacket and then slid over the book. No matter how great the summary, low ratings will always turn me away from a book, unless it is a recommendation by a trusted reader. While I can read some autobiographies and memoirs, I find that biographies have a very dull tone and I've never completely got through them. I only pick up autobiographies by people whose stories I am extremely determined to find out. I will never knowingly pick up a book in a series with more than seven books. It gets very tedious and monotonous to read, All of this of course, is countered by recommendations! I love a lot of sci-fi books but I've never really tried a Robot or Cyborg book! I can't say I hate them without having tried them, but I guess I'm just waiting for the right book! Not a zombie fan either. Or horror. I might like an occasional scary read and I do like thrillers, but not the horror. Biographies I've read a few but yeah, generally not interested. We seem like extremely similar readers, Greg! I agree Geybie, the writing is usually slow and I'm usually not a big enough fan of the person to want to know all their life stories! Ugh yes to zombies and bad grammar! I cannot deal with them- I just can't! Horror is a no go for me too. Just don't like being scared. I don't mind the feeling of being scared in general, I just don't understand why someone would intentionally scare themselves.